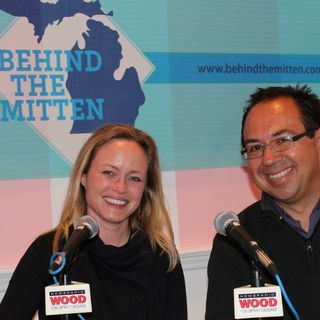 On this episode, John and Amy spend some time in Rockford and the Traverse City area. They talk chicken wings, distilleries and more! Segment 1: John and Amy talk to Richard Andersen of Iron Fish Distillery in Thompsonville, which is about to celebrate its first anniversary over Labor Day. Segment 2 (Listen at 10:31): John and Amy head to the Rockford Brewing Company, where they talk to reps from The Corner Bar, an iconic hot dog ... Más informaciones restaurant that recently suffered a total loss due to a fire. They talked about how they will rebuild and how the community has come together. Segment 3 (Listen at 19:19): Michigan author Doug Stanton is in the news lately because the USS Indianapolis, the topic of his 2002 book, "In Harm's Way," was discovered. Doug is also the co-founder of the National Writers Series in Traverse City. Segment 4 (Listen at 29:10): Seth Rivard and Chris Holt of Rockford Brewing Company welcome back John and Amy; they talk about upcoming events, as well as BEER of the WEEK. The beer is the Hoplust IPA, which is RBC's most popular beer. It its an American-style IPA with a lot of hops on the nose, but not overly bitter on the taste. It is being released in bottles.